about little choices that have huge results. Most students approach a study skills course (or book) with little or no enthusiasm. They are ready to get in, get out, and get ahead. A study skills course seems to be a needless complication. And, that’s understandable! But there may be a bit of illusory superiority here. A recent national study (CIRP 2010) found that nearly 72% of incoming first-year college students rated their academic abilities as “above average”/”highest 10%.” Nearly two-thirds of the entering students “expected” to receive grades of “B” or higher. Hmm. While we might generally see study skills as dry academic skills, they represent much more. From my perspective of 30 years in the classroom, I have found that study skills are more than just learning how to read a textbook, take class notes, and score well on a test. Study skills are really about discipline; about developing habits that move you and me (not just students) closer to our goals; about little choices that have huge results. Locus of control (literally, focus of one’s power) describes how people explain events in their lives. In short, do we blame others or do we take responsibility for our choices? Perhaps you have heard the saying that practice might not make perfect, but it can make permanent. Take that to its logical conclusion and it is a safe bet that practicing bad habits can lead to permanent bad habits. Effective study skills will help students develop those good habits that will serve them well. Evaluate information about their past and present study skill performances. Draw conclusions based on the examination of facts. 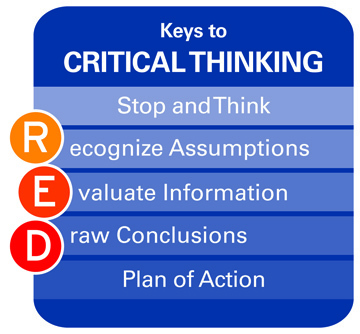 [Watson-Glaser Critical Thinking Appraisal, Forms A/B (WGCTA). Copyright © 2007 NCS Pearson, Inc.
That pretty much sums up the philosophy of this book. There are no quick fixes. But there are smart strategies; strategies that require critical thinking so that we can separate fact from fiction about what we can and cannot do effectively. A good study skills book, course, and instructor will concentrate on practical skills to build academic success as well as a positive self-image. These skills help make the transition from being a student who simply gets by to being a successful student who is aware, insightful, and confident. Again, these are important workplace and life success goals. 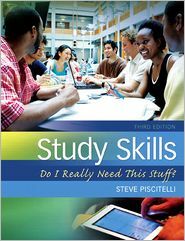 For more information about Study Skills: Do I Really Need This Stuff? (3rd edition) please visit my website (www.stevepiscitelli.com), contact me at steve@stevepiscitelli.com, or see order information at Amazon and Barnes and Noble. This entry was posted in Discipline, Study Skills. Bookmark the permalink. 9 Responses to (#85) Study Skills: Do I Really Need This Stuff? Study skills, do I really need them??? Heck yea!!!! I really need this stuff!!! In fact, I believe this class should be a requirement for all students entering college. I feel that the universe has wisely led me to this class, my instructor and all of my experiences this semester. Believe it or not I espouse the information that I have learned from my textbook and class to my friends and family (in a helpful way of course!). Critical thinking, study skills…Thank you SLS 1103 and thank you Professor P!!! My locus of Controll reminds me to own my decisions and choices I make whether they are good, bad or indifferent. I really thought I possessed the necessary study skills to make an A in most of my classes. After some time in this SLS Class I realize I did’nt really have a clue how to study effectively. I have to definitely acqu ire some better study habits. You have made a critical first step: Awareness. Then it is time for action! Sometimes when I think about my future I need to h.t.r.b.. I feel like I’m not doing enough to ensure my success. I beat myself up on a daily basis about just doing all the right things. Reading this blog on discipline has made me realize nothing changes without time. I can’t expect so much from myself in so little time. As long as I keep my locus of control I believe I will be just fine. Hi professor ! I’m an English Studies student in Morocco, Meknes. In our university we study a subject called Study Skills our studies in this subject includes your great work ” do we really need this stuff ? “. It’s a little bit difficult for me to keep it up, considering English not my mother tongue. But your presentations making it a lot easier, so I wanted to thank you for your help. Thank you so much. Thank you for your kind feedback. I have taught many international students over my years on campus. I have always found them to be diligent and disciplined in their studies. I enjoyed working with them each semester. I have a study skills playlist on my YouTube channel as well. Perhaps that would help as well. You can access it through my website: http://www.stevepiscitelli.com. Best wishes to you!